About » Teaching Philosophy & Goals – CHRISTINA RICCI MORE PARS! An amateur sharing my personal story. As a professional, I feel empowered to empower. I believe the first order of business is fun. I teach in person and I teach through media content. Look for Christina’s Tips on the Golf Channel! As a teaching professional, I feel empowered to empower. When I began my journey, I was an enthusiastic player with a desire to share my learning experience and game accomplishments. I took up the game in 2000 and accomplished a 5 handicap in five years. My passion and commitment to the game shifted my career from owning my own marketing & branding company, into the golf world full-time. Sharing my expertise visually —print or video—is what I do best. As a professional golf instructor, I am now able to provide research-backed and student-centered learning content that can create significant change in how golfers learn and play the game. My deep passion is a continued focus on educating, inspiring and motivating players of all ages with skills to discover more pars for optimal performance and enjoyment. I began my creative journey when I was a little girl, showcasing my drawings to everyone on the school bus. My joy in life has always been creating. We are each on a unique path. There is not one way to journey through life. I believe that we each come into this world doing something better than anyone else on the planet. It is our mission, while here, to find that true and unique path. There is not one way to journey to more pars. I also believe that we learn better when we are having fun. Children got it right. They create fun. It is my job as teaching professional to re-introduce my students to the power of creating fun. Too many forget that golf is a game. As a golf coach, I like to create long term relationships with my students. I enjoy experiencing their journey as they begin to drive it longer and sink more putts. I most enjoy players who are REALLY passionate. I am also very passionate about helping players enter the game. The game can be intimidating…I know. My job is to make it fun and enjoyable on day number one. Although women’s golf instruction is my niche. I teach players of all levels. For me, as long as you are passionate about the game and willing to practice and focus…I’m your More Pars Coach! I am TPI Golf Level 3 Certified. TPI’s mission is to educate golfers and industry professionals on the body/swing connection through its ‘TPI Certified’ educational program. Why I believe in TPI education: TPI is in line with the LPGA Student-Centered model. I need to know what my students can and cannot do on a physical and psychological level, so that I can be a better coach. I have always set goals instinctually, but never systematically. I now understand that setting goals, systematically or through a process is much like setting an agenda …a motivation agenda for improving. For example, if my student sets 3 achievable challenges, setting an agenda provides a reason to achieve and allows for evaluation and self-accountability. Goals create a process for achievement. I use a star rating system with my students so they can measure and compare against other practice sessions and goals. Muscle fibers do not remember anything. Muscle fibers do not have a separate independent “mind” of their own. All memory is retrieved from inside the brain which commands all action and response. Google the Wadman Experiment to learn more. Our goal in golf is to train the brain to deliver information to the muscle. The muscle just obeys orders. At the gym, we do reps to build muscle. On the course, we build the brain to deliver a consistent golf swing. I believe Dr. Debbie Crews work on how the brain performs best delivered to the golf population through her Opti-Training has the potential to be a game-changer for the game. I teach my students the learning process so they can take control of their golf game, not the other way around. I keep it simple. Motor Skills are stored in a part of a brain that is almost impossible to get rid of. You cannot get rid of motor skills, but you can replace them with new ones. If you swing over the top, you’ll always swing over the top, unless you replace it with a new motor program. Think of it as installing a new software program or writing a new book. I invite and encourage my student’s to write their own books. If you really want to learn, then you need to randomize your practice. That is my message to my students. Something happened, certainly way before I entered the game that said: “Bang a bazillion balls and you’ll get better.” I was part of that racket. Our job as Golf Professionals is to re-educate on the process of learning. BLOCK PRACTICE is technique / skill practice. It is what we see at the range with many players: hitting a bucket of balls using a 7-iron; hitting 50 balls, getting a groove as you repeat the same swing with the same club. To optimize its effectiveness, block needs be super targeted and limited. using the same club, you use all clubs, change up the shot and target for each ball. Just as you would out on the course. I am having the most fun when I create. If you care, you will give it your all. Student Stated: I was so impressed when you would not give up on us. You made sure we understood. When I am passionate, I have endless energy and enthusiasm. If you are not having fun…do something else. When we stop growing, we die. For me it is quality, not quantity. I believe I can make a significant difference, while here. If we simply bang balls with the same 7-iron, we are not really learning. All we are doing is repeating. Improvement is short-lived. If you simply copy a shot over and over, you are not learning the process of creating that shot. Instead, we need to create a process. My goal is to teach students how to learn and how to create. Empowered students stay in the game. I have authored four books, but did not teach until I was certified. As an LPGA member and TPI Golf Level 3, I now feel confident that I can deliver great results for my students. I reside in New England and teach locally at Atkinson Resort & Country Club's Willowcreek Golf Academy located in Atkinson, New Hampshire. I love seeing the smiles on my student's faces when they get more pars. My goal is to help you achieve your goals. I have helped grow and promote the game of golf to women in a personal and unique way since 2008. More than 100,000 women have been touched by my brand. I define success not by how much money is in the bank, but how many more pars on scorecards, how many more players in the game and how many more smiles from all the pars they are getting. I enjoy helping others. I enjoy teaching. I enjoy the joy I witness in so many players when they see progress. I feel fortunate that I can communicate through media and speak to so many varying skills and ages. My tagline says it all. Golf is a journey…let's journey together. Christina my custom evaluation is totally fantastic! I've never had such good information!! I'm finally able to get on a course this week and I can't wait to try out all of this new stuff. You are amazing!!! I will let you know how it turns out after a few practice sessions. Many, many thanks!!! I love these books. They have been so helpful with my learning process. I’m truly a visual person and the colorful illustrations and the Pink book DVDs have been a great asset in my efforts to gain knowledge in this game. I truly love what you’ve put out there and have found absolutely NOTHING better to help me in my efforts. Thanks again and keep them coming! This video is so helpful. Keeping my shoulders down as made a huge difference in my game. To the point that golf friends are asking me who I am taking lessons from....I tell them Christina Ricci. You have had a greater positive impact on my game than any other person I have taken lessons from. Thank you for breaking down the key points without pointing out too many things at once. Each week Christina delivers a tip to your inbox. Subscribe for free or become a Tip of the Week member and gain access to all her tips…anytime and anywhere. That is a beautiful range!!! Love the guy in the background. lol I try all of your tips, Christina, and my golf game is much better. Maybe today’s tip will help me with a slice that has plagued my drives for a while. Seems like there are certain holes on the course where I always slice my drive. Must be something inside my head on those particular holes, such as, you always hit a slice on this hole so let’s just do it again! First of your video tips I’ve received and I can see already I’m going to take something from each one! Raining still in Seattle too! This is always a tough shot for me. I really should walk up and assess the shot but usually worry that I am taking too much time and hurry it. Club choice is always a challenge for me since I have been golfing such a short time. By the way, is your 58 degree club slightly less of an angle than the 9 ? I would guess so since you want the ball at a lower angle after you hit it…I am not familiar yet with the different degrees..l guess I should do that. Repetition isn’t enough unless it’s wrapped in the entire shot process. Otherwise, it won’t stick. Christina Ricci is an LPGA member and TPI Golf Level 3 Certified. 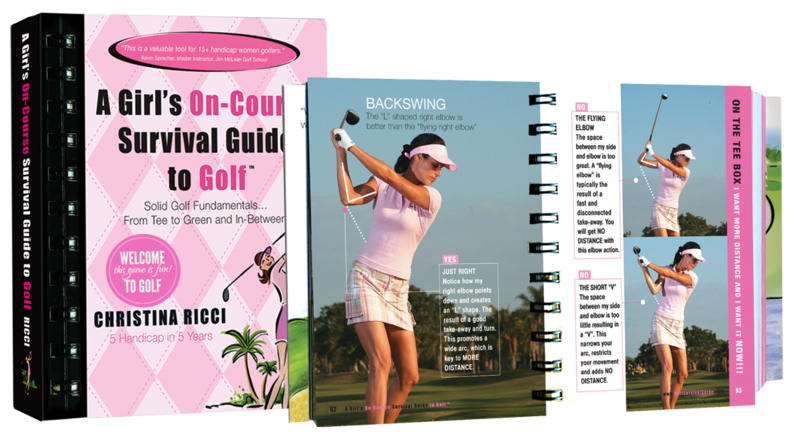 She has authored four Golf Survival Guide books and is a strong advocate for growing the game, educating players on the importance of professional golf instruction, and providing educational tools to learn the game in a fun and approachable manner. 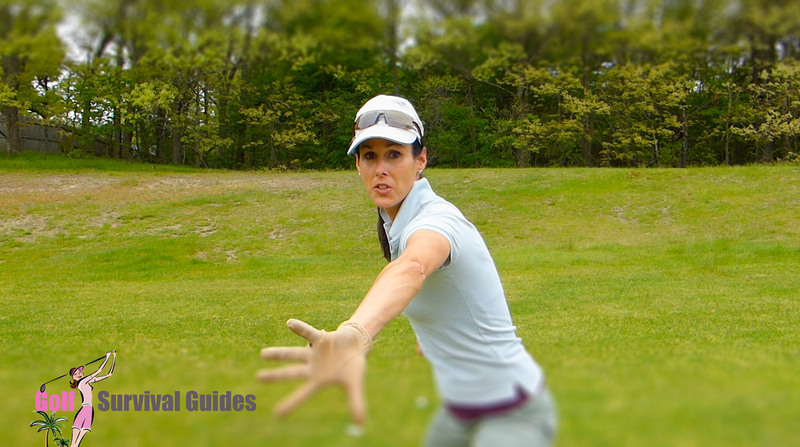 Her unique female perspective and personal journey inspire players of all playing levels to reach their personal golfing goals.